16 out of 49 pages. 17 out of 51 pages. Seems some of the best Fathers Day posts come from Joe Kelly's run on ACTION COMICS. Here are a few pages from ACTION COMICS #800. They focus on Jonathan Kent and one of those "mentor figures" Clark had during his "walk the Earth like Caine in 'Kung Fu'" phase. I have posted this before, but it is great for Father's Day. ACTION COMICS #797 is a "cool down" issue after "Ending Battle." Superman is explaining some things to Claire Foster, a therapist recommended to him by J'Onn J'Onzz. He's changing the names, of course. I'm starting college again Monday, so will likely have less time to spend on Scans Daily. Therefore, now is the time to make an extra-large post.Given my own proclivities, I'm sure you're not surprised it's a Superman comic. To be precise, Action Comics #500. 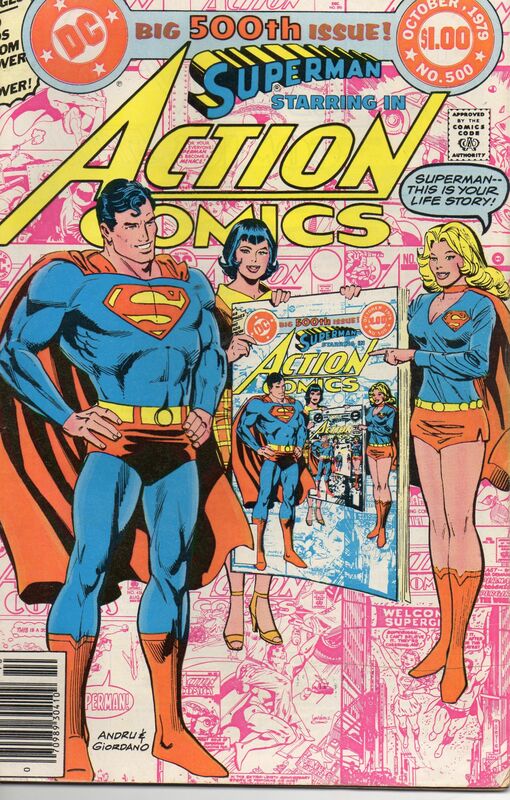 We'll have a glorious 21 pages of a 64 page story, a time capsule of what Superman was like in 1979. 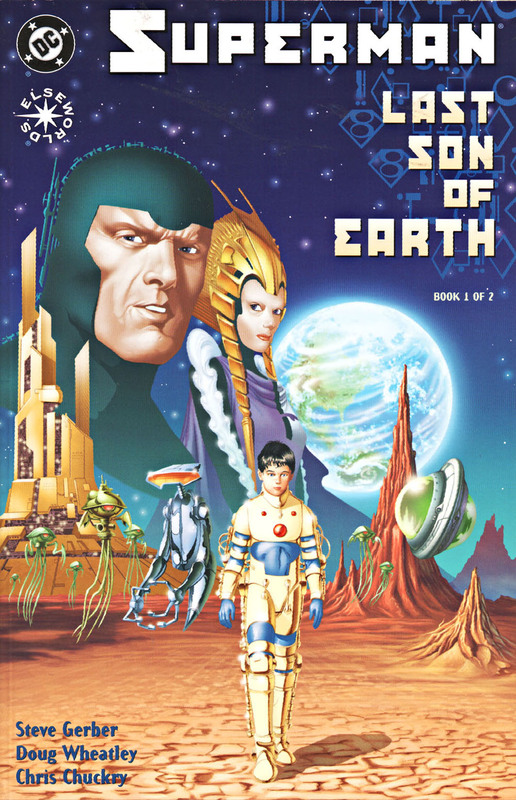 Action Comics #5 The Orgins Of Lex Space Goat. 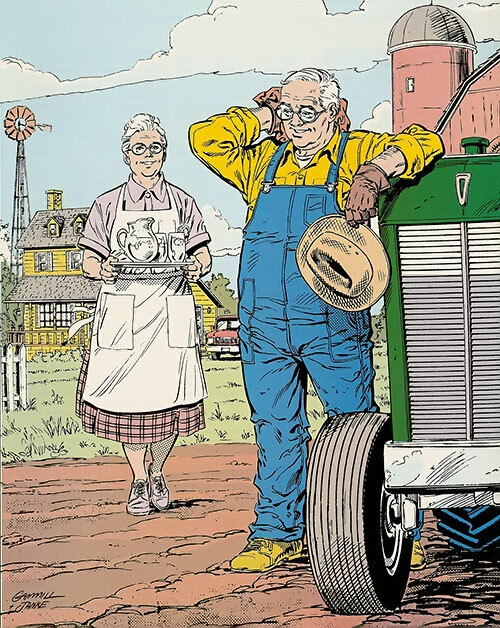 You can say a heck of a lot about Jonathan Kent. Here's two pages of Clark Kent doing so. From ACTION COMICS #797 after the end of "Ending Battle." Because feyandstrange was the only one who voted for it, consider this post a fulfillment of request. Spy and Counterspy was published by American Comics Group - publisher you may remember as home to Herbie the Fat Fury and Cowboy Sahib. The title was billed as a combination of intrigue and action (for boys) and romance (for girls), which was a fairly interesting concept. After 2 issues, it was renamed Spy-Hunters. together, the title lasted 24 issues, between 1949 and 1953. Now, some historical background. The first issue of Spy and Counterspy was published in August 1949. The tensions between United States and Soviet Union have been simmering since the end of World War II. In the aftermath of the war, nobody was too keen to fight again, but the risk was always there. Only a few months before the issue was published, the Cold War almost turned hot when Stalin tried to prevent Western powers from delivering supplies to Berlin. And it would only be a few more months before the Soviet-backed Democratic People's Republic of Korea would invade American-backed Republic of Korea, triggering the Korean War. You can't really blame Americans for being paranoid, and boy did the writing in the comic reflect that. The first issue of Spy and Counterspy had many interesting stories, but ultimately, I decided to share this one for a simple reason - the name of the protagonist. Because a name like that is just asking for jokes and wild theories. Unfortunately, the credits were lost in time, so I have no idea who wrote or drew that. Tune in next time to see some letters' pages from various Novelty Press comics. But even if he doesn't play Kal-El, to me, Jon Hamm might have a place in the next Superman movie. There were a few notable DC characters who didn't get to be Black Lanterns--one of them was Pa Kent. So let's go back in time, to a story where Pa Kent rises from the grave for one last visit to his son.